I started journaling regularly in my early teens. For me it was a chance to express what I had difficulty saying out loud - voice my questions about life, friendships, hopes and concerns one generally has at that time. I continued to journal on a fairly consistent basis until my late 20s when I was introduced to a group journaling practice based on the work of Progoff. Writing has saved my life many times over. It has permitted me to make sense of my feelings, make better choices, grieve, celebrate and reflect. In exchange, I have become one of its biggest advocates. It remains an important part of my own life. I continue to write and reflect daily. I recently created a coloring book/journal for ‘helpers’: anyone who spends a large part of their life helping others professionally or personally. I wanted to encourage mindfulness and self-care. I am quite proud of it and am now working on producing a French version. 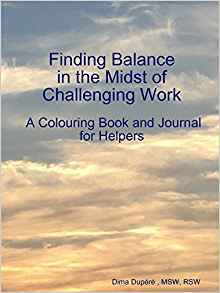 Finding Balance in the Midst of Challenging Work is available on Amazon and Barnes and Noble. My publications include a Manual for professionals on how to use therapeutic writing, some prompts for journaling at year end and the colouring book. 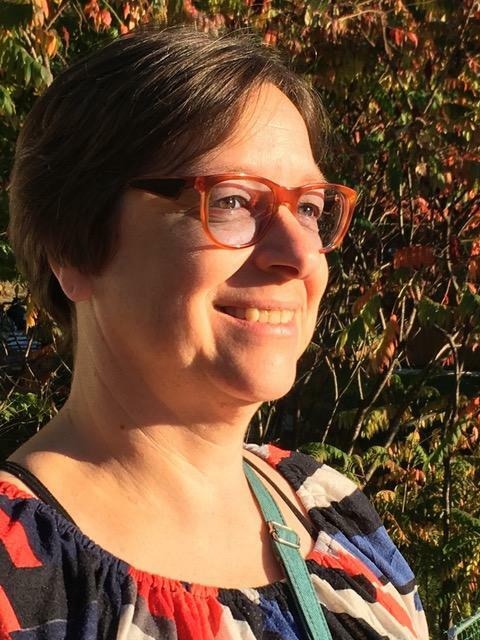 Passionate about the therapeutic value of words and art, Dima Dupéré is a therapist / social worker who engages creatively to help people thrive. Whether facilitating a group, training professionals or offering individual psychotherapy, Dima believes the first place of healing is found in the stories individuals tell themselves and others. Her specialty is therapeutic writing (for groups or individuals), something she has practiced in her own life for over three decades. Her clinical approaches include: psycho-education, cognitive behavioural therapy, ego state therapy, narrative therapy and are always strength based. Her main interest is to assist individuals with life transitions, in particular life changes caused by illness or injury, chronic pain, grief, mental illness or childhood trauma. She has found that integrating writing exercises into her practice assists clients in finding their voice, their strength and their individual path. As well, they get to know themselves better and increase in self-esteem and confidence.